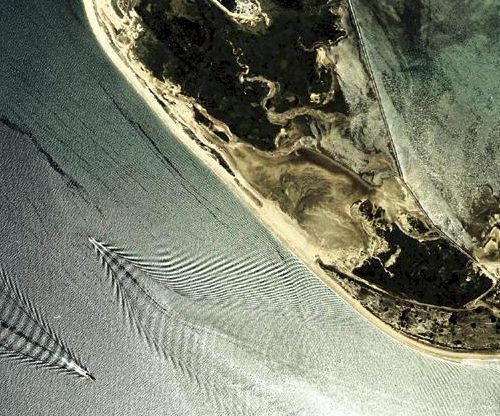 These color coastal orthophotographs were generated through a cooperative effort between the Massachusetts Coastal Zone Management Office, the NOAA Photogrammetry Division and the National Geodetic Survey. The data covers most of the coastal zone region. Digital orthophoto production was provided by Photo Science Inc. of Gaithersburg Maryland. The data set is tiled identically to the MassGIS black and white orthophotos for both the mainland and island regions (398 images; see the Coastal Color Orthophotos Index datalayer description). Additionally, one more image was created for Noman's Land and is not based on the same index. The color aerial photography was captured in September and October of 1994 by the Photogrammetry Division of NOAA. The scale of the original photography is 1:48,000. Differential airborne GPS was used for control. Approximately 31 flight lines were conducted, with the orientation of the flight lines designed to cover the maximum area of shoreline. Approximately 360 were captured. Approximately 16 ground panels were placed in the field and surveyed. Aerotriangulation was conducted by the Photogrammetry Division utilizing analytical stereo plotters. The control was processed using 3 block areas: A) North of Boston, B) Boston south including the Elizabeth Islands, and C) Martha’s Vineyard with Nantucket. Control was developed to provide an accuracy that exceeds NMAS of 1:10,000. In large portions of the area, control exceeds the NMAS for 1:7,000. Diapositives were scanned for a final output resolution of 1.0 meter. Scanning was done to match the diapositives as closely as possible. Bulk radiometric adjustments of the imagery was conducted using Adobe Photoshop "auto levels" to remove the green haze and to stretch the contrast. Mass point and breakline elevations were created and used in the production. Only mass point elevations are available for the area. Elevation data was developed primarily for the purpose of orthorectification, and not for detailed contouring. Images for Martha's Vineyard and Nantucket were originally georeferenced to the Massachusetts State Plane Island Zone coordinate system, but have been projected in ArcInfo to the Mainland Zone for consistency with other MassGIS data layers. These mainland-zone images for the islands became available in June 2001; the images for all other areas were released in February, 1998. The original one-meter images are 48 MB per tile. Two-meter versions of the images, resampled in ArcInfo, are 12 MB each. The tiles are in TIFF format and are accompanied by .tfw header files for georeferencing in GIS software. In addition, versions of the one-meter images in the MrSID format have been created at 30:1 compression with 8 zoom levels. These are available as one single mosaic comprising the entire coastline, including Martha's Vineyard and Nantucket. The one-meter SIDs may be downloaded.